This is a “dashboard” that shows seed placement, depth and spacing and allows for real-time monitoring of planting. 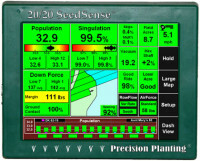 The 20/20 SeedSense Monitoring System is proven to give you better farming information and more information. This farming information that lets you actively manage your planter—and make changes that will make you move. Customize your view in HD with a Gen 3 20/20. The 20/20 system fits the way you farm. Take control of the data you collect, and choose from a limitless number of customizable views. See what information is most important to you, and understand what’s going on during every pass through the field. 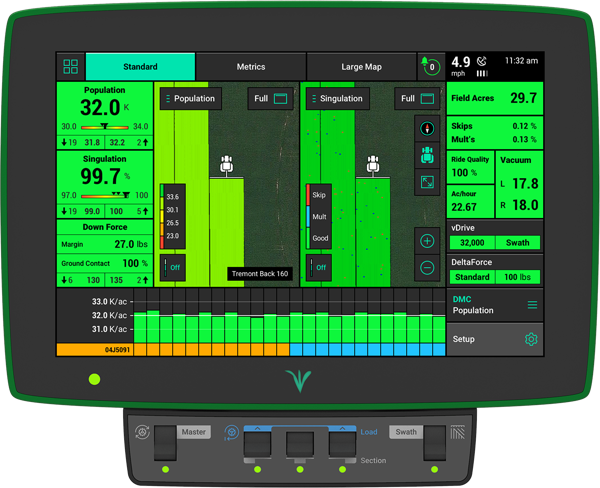 The Precision Planting vSet meter and mSet multi-hybrid components allow you to build the system you will utilize now and in the future. If today you decide to add vSet to your planter with mini hoppers for a single hybrid and then in the future add the mSet seed selector, you use the hopper you already have. If you want to move from mini hoppers to a 1.6 bushel single hybrid or dual hybrid hopper, you simply add on to your existing mini hopper. A purchase today is an investment in your planter for the long term, without needing to switch out hoppers with each additional upgrade. The FurrowJet planter attachment allows fertilization by adding starter and additional fertilization simultaneously to optimize the starter placement. FurrowJet is a planter fertilizer attachment which enables you to place not only an in-furrow starter fertilizer, but also a dual-band of fertilizer 3/4″ on each side of the seed. FurrowJet rides in the furrow just above the seed, firming while placing starter. Wings on FurrowJet angle downward to cut into the sidewall and place fertilizer alongside the seed in a dual-band. By being near-furrow, this placement gives the seedling and crown roots immediate and continuous access to the nutrients. Combined with accurate placement, FurrowJet is flexible, allowing increased rates and common starters to be applied safely, avoiding seed burn risk. vApplyHD allows liquid on any kind to be administered. This precision planting product offers additional control in its applications over other liquid dispensing applications. vApplyHD is the industry first, on-row liquid control product which incorporates flow measurement and control into a single device. Its row-by-row features include turn compensation, swath, automatic flow balancing, and variable rate prescription execution. 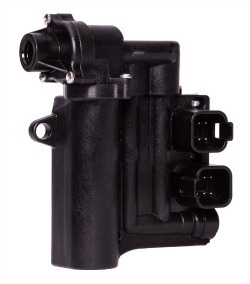 The module is easy to install, simple to use, and designed with industry leading flexibility. The vApplyHD module is used, without modification, from the lowest pop-up rates on the planter to the highest sidedress rates, across the full range of speeds. vDrive is an insecticide meter that allows accurate row-by-row insecticide delivery. Normal insecticide meters are chain driven and accurate at a single speed. In the past, if you wanted to use an electric drive for your seed meter and apply granular insecticide, you would have had to leave the chains. Not anymore. vDrive Insecticide is the electric motor-driven insecticide meter that provides accurate delivery across your entire speed range. Row by row control for your insecticide delivery is now within reach with this precision planting technology. Plant two times faster with a SpeedTube, which attaches to the planter and allows for greater speed and accuracy in planting. SpeedTube is a precision planting masterpiece of engineering. The planter of the future is in your shed today. SpeedTube allows you to increase your speed and ensure spacing accuracy, while maximizing your planting window. Designed with performance, durability, and ease-of-use as the core objectives, the SpeedTube planter attachment is a must to add value to your bottom line. When planting seed, it is important to control seed depth. DeltaForce™ uses industry leading technology to meet each depth. 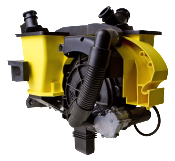 DeltaForce™ works with 20/20 SeedSense® replacing the springs or air bags on your planter. 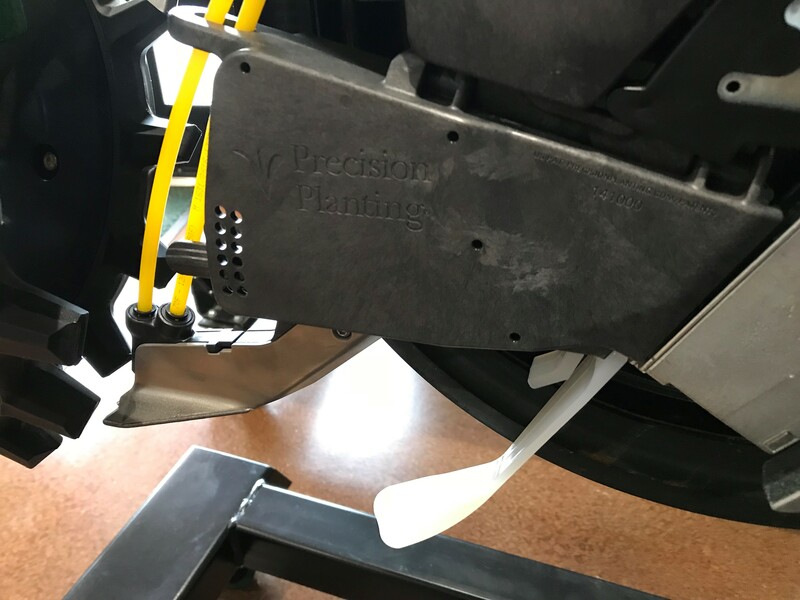 Nothing controls down force better than DeltaForce™ from Precision Planting. 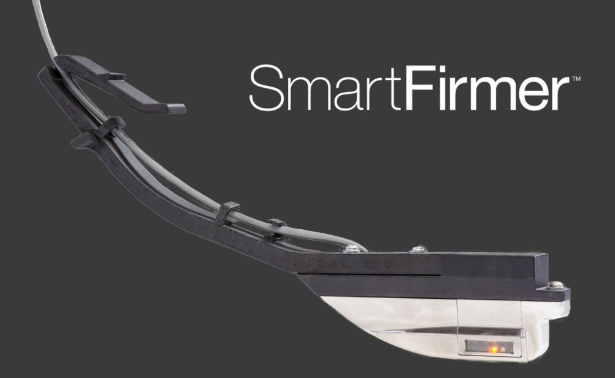 In every foot on every pass, in each individual row, it monitors row unit weight and ground contact, then instantly and automatically adjusts to maintain the depth you set. In a four year study, managing down force improved yield on average 8.7 bushels. * It’s a simple solution to improve yields and win. vDrive™ for vSet™ delivers even more precise population with greater simplicity. Powered by 20/20 SeedSense®, vDrive brings single-row control to your vSet meters. It enables incredibly precise population control on curves, when your ground speed changes and with all variable rate prescriptions – even highly granular FieldScripts®. 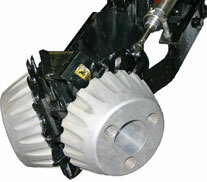 This planter attachment clears the plant bed as the seeds are planted. You no longer have to hope, but you can now manage your row cleaner performance, on the go from the cab of your precision farming planter. Row Cleaners are a great planter attachment for handling excessive residue during planting. They remove the plant debris and create a uniform seedbed. Allows more than one seed type to be planted within the same row. No more missed yield potential. Multi-hybrid planting is here. With the radically new vSet Select, there are no compromises. You can plant two hybrids in the same row, switching back and forth as environments change, to plant the hybrid that will produce the most in each environment. That maximizes yield. Similar to DeltaForce, AirForce Down Force Control manages seed depth by controlling the force that the planter uses. Too little down force means shallow plants, too much down force means restricted root growth. 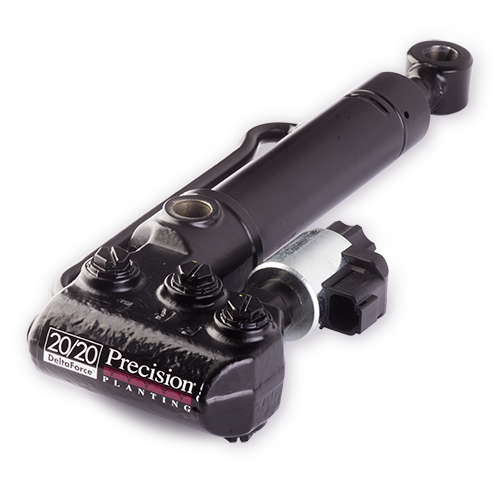 By pairing up the 20/20 AirForce with 20/20 SeedSense® automatically measure and manage down force to make sure you run as light as possible, while maintaining the ground contact that assures uniform seeding depth. 20/20 Row Flow allows seed placement rates to vary and be controlled by the farmer with the 20/20 seed sense dashboard. Get the right seeding rate in the right place. Get the money saving benefits of swath control and variable rate population control in one package. 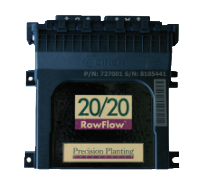 Combining the 20/20 RowFlow with 20/20 SeedSense® to provide automatic control of variable rate drive systems (to change plant populations) and swath control (to shut off individual rows or sections of the planter). YieldSense shows real-time crop yields as they are harvesting. Other technologies can tell yield data from field to field, but yield sense is able to show it row to row. This precision planting system works along with 20/20 SeedSense Monitoring System. 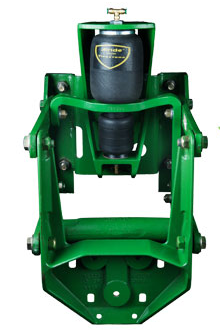 The YieldSense system combines the power of the SeedSense® monitor with a new flow sensor, elevator chain and paddle. Add the FieldView® app on your iPad® for high definition mapping. With FieldView Plus, you can share yield data between combines and other iPads. Share coverage maps and automatically build complete yield maps from multiple combines. And, if you used your SeedSense for planting, you have your hybrid and planter performance data in the combine cab with you. YieldSense works with corn, soybeans and wheat. A CAN-based moisture sensor is required for operation. Bottom Line Solutions strives to add value to your bottom line through minimizing inputs and maximizing outputs. If you’re interested in learning more, let’s talk!